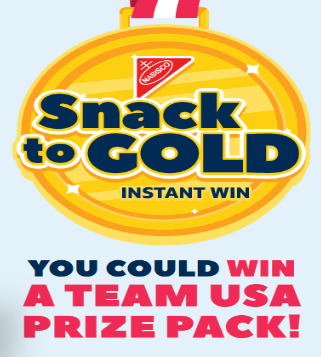 Nabisco Snack to Gold Instant Win Game – Win a prize pack worth $100! Win a Nabisco prize pack worth $100 (contains Nabisco products and Nabisco-Team USA merchandise) – 70 winners! ENTRY LIMIT – Limit: There are concurrent NABISCO Snack to Gold programs. You may only receive one (1) Instant Win Game play per day per email address/person across all NABISCO Snack to Gold programs during the Promotion Period. ELIGIBILITY – Instant Win Game is open to residents of the 50 United States (D.C.), who are 18 years of age and older at the time of entry. SWEEPSTAKES ENTRY PERIOD – NABISCO SNACK TO GOLD – AWG (“Instant Win Game”) begins at 12:00 am ET on February 9, 2018 and ends at 11:59 pm ET on February 22, 2018. PRIZES – Seventy (70) Instant Win Game Prizes: A Nabisco prize pack containing Assorted Nabisco-Team USA Merchandise along with Nabisco product. All details of prize pack are determined by Sponsor in its sole discretion. ARV: $100.